Asus has never really been a run-of-the-mill player on the smartphone scene. Sure, the Taiwanese company’s lineup has been including more and more traditional offers in both the budget and flagship segments, as of late, but nothing really all that revolutionary, influential or memorable. One thing that has managed to stick as sort of a defining reputation of Asus smartphones over the years is a rather uncommon PC approach to mobile phones. Whether it be the long-standing insistence on a confusing, convoluted model numbering convention, more suited for the laptop market or the fairly lengthy experimentation with Intel Atom chips in phones. Back in the present 2018 reality, however, Intel has long abandoned its mobile Atom efforts and whoever is in charge of product naming at Asus has mercifully taken all the criticism to heart. 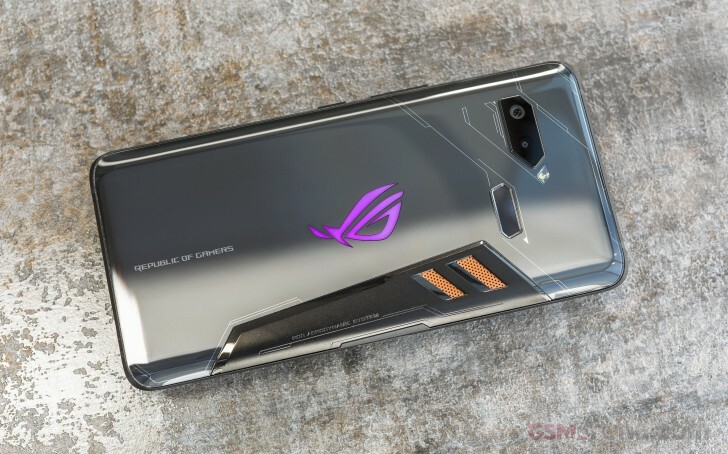 But just when we thought that the major PC player had lost its experimental spirit somewhere along the path of “PadFones” and dedicated AR setups, the ROG phone dropped. The timing seems to be just right and clearly not coincidental. With manufacturers finally trying their hand at gaming-geared smartphones with various degrees of success in an ongoing effort to craft the still mostly non-existent niche within the mobile segment, the Republic Of Gamers landed hot and heavy with a masterclass on how things are done in the gaming world. In more ways than one the ROG phone is a benchmark, a practical example of what a gaming phone could be when you really have the expertise, experience, and the technical prowess to pull it off and dial everything to eleven. Body: Metal frame; Gorilla Glass 6 front; Gorilla Glass 5 curved back; 158.83 x 76.16 x 8.65 mm, 200g. Display: 6.0″ AMOLED, 90Hz(1ms pixel response time), 1080x2160px resolution display (18:9 aspect ratio), 402ppi pixel density; 108.6% DCI-P3 color gamut; Wide Colour Gamut; HDR display through dedicated hardware display chip. Rear camera: Primary 12MP, f/1.8 aperture, 1.4um, 1/2.55″ sensor; dual pixel phase detection autofocus; 4-axix OIS. Secondary 8MP, 12mm ultra-wide, fixed focus, LED flash. Up to 4K/60fps video recording on primary and 1080p@30 on secondary camera. EIS available on all resolutions. Front camera: 8MP, f/2.0 aperture, 24mm, 84 degree field of view, fixed focus, 1080p/30fps video recording. Chipset: Qualcomm SDM845 Snapdragon 845 (10 nm): octa-core CPU (4×2.96 GHz Kryo 385 Gold & 4×1.7 GHz Kryo 385 Silver), Adreno 630 GPU. Memory: 8GB of LPDDR4X RAM, 128/512 GB of storage. Battery: 4,000 mAh Li-Po (sealed); HyperCharge 20W charging; compatible with QC4.0 charging. Connectivity: Dual SIM (Nano), 4G on both slots; LTE Cat. 18 (1Gpbs download), Cat. 13 (150Mbps upload); 2x Type-C USB 3.0 port; Wi-Fi a/b/g/n/ac, WiGig Wi-Fi ad 60GHz; GPS, GLONASS, BDS; NFC; Bluetooth 5.0; FM radio. Audio: Dual front-facing 5-magnet speakers, dual NXP 9874 smart amplifiers; Hi-Res audio 192kHz/24-bit DAC; DTS (Digital Theater System) Headphone:X 7.1 virtual surround sound for headphone support; AudioWizard with listening profile; Triple internal microphones with ASUS Noise Reduction Technology. Misc: Rear-mounted fingerprint reader; 3.5mm jack; Proprietary Side-mount connector for accessories (a second Type-C port is part of it); Ultrasonic sensors for AirTriggers and grip press. Even at first sight, purely on paper, the ROG phone leaves little doubt of its alpha status among the select assortment of “gaming” phones available in 2018. Asus clearly set out to do just that – set a benchmark to collectively strive towards. This makes the ROG phone and its vast ecosystem of futuristic accessories immensely fun to explore. 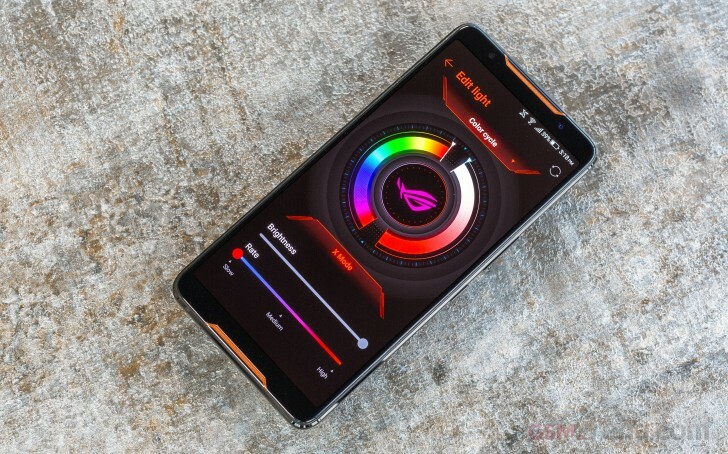 Before we delve any further though and discuss the numerous unique aspects of the ROG Phone design and the particular unique approach to mobile gaming hardware, it is also important to make the tech showcase nature of this product abundantly clear. 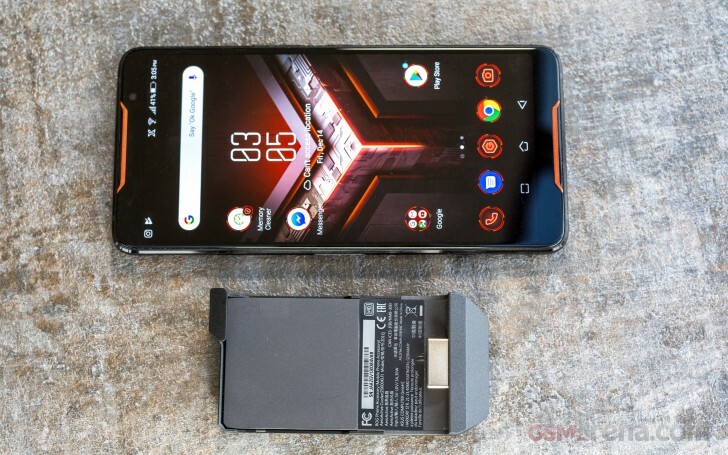 For most regular users out there, even the more gaming-enthused, the ROG phone is going to be way too exuberantly over-engineered to recommend. Not to mention exuberantly priced. Still, that doesn’t mean we can’t enjoy what Asus has so masterfully crafted purely from a technological standpoint and as a potential showcase for what might be in store for the future of mobile gaming. We kind of feel like the unboxing experience alone deserved a whole page in the review. However, that is mostly true for every aspect of the ROG Phone. Everything about it is crafted with the clear intention to impress. 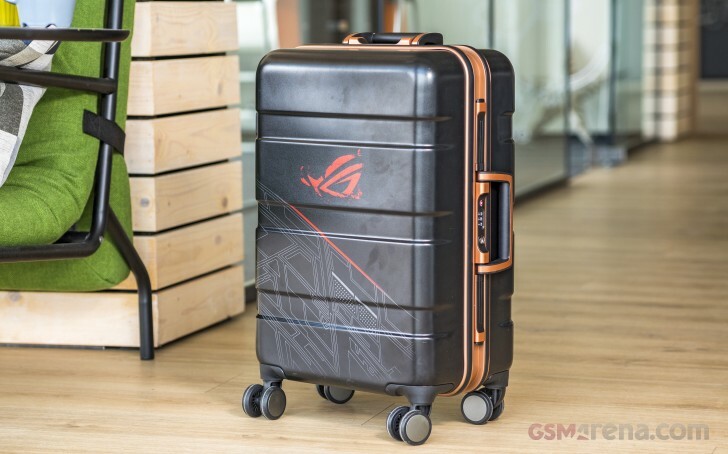 Our review kit, including all the attachments and accessories, arrived in an exclusive ROG-branded suitcase. And when we say ‘suitcase’, think of one that barely qualifies as hand luggage on some airlines. Of course, that is going to be a reviewer exclusive presentation, but that doesn’t diminish its grandeur. It’s perhaps the flashiest review guide box we’ve seen. 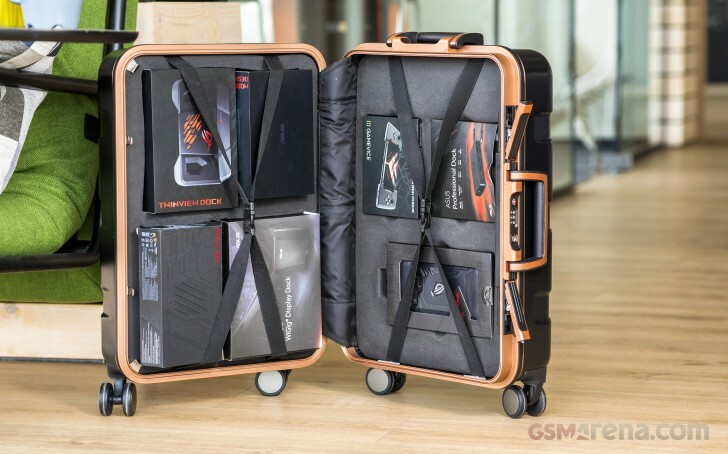 Inside the hardshell briefcase we find precisely cut-out foam inserts and a plethora of gadgets – the TwinView Dock, GAMEVICE, Mobile Desktop Dock, WiGig Display Dock, ASUS Professional Dock and a phone case, which we will all get into in greater detail later on in the review. The actual ROG Phone box is pretty eye-catching in itself as well. It has an asymmetrical hexagon shape with a distinctly alien look to it. Pretty much the aesthetic you would expect from a Republic of Gamers product. Inside the odd container, you get the phone itself, which also features similar design language, but more on that in a bit. Alongside it – a Type-C to Type-C braided USB cable and a pretty compact wall adapter, rated for a maximum output of a hefty 30W. The adapter is actually rated for QC4.0, PD3.0, as well as a proprietary Asus direct charging standard, making it amazingly versatile to carry around. That being said, however, the ROG Phone can’t really charge at a 30W rate, Instead in caps out at around 20W via a proprietary HyperCharge technology. It utilizes a smart IC on the side of the charger and pumps juice into the battery directly. Much like other implementations like VOOC or Huawei’s SuperCharge, the idea is that all the conversion happens in the brick outside of the phone, which limits the amount of heat generated inside the handset. That allows the charging to commence with higher current levels, without upping the voltage, like Quick Charge does. Speaking of which, Asus also rated the ROG Phone’s existing internal charging IC for Quick Charge 4.0. So even if you don’t have your ROG charger at hand, you can still get fast top-ups. 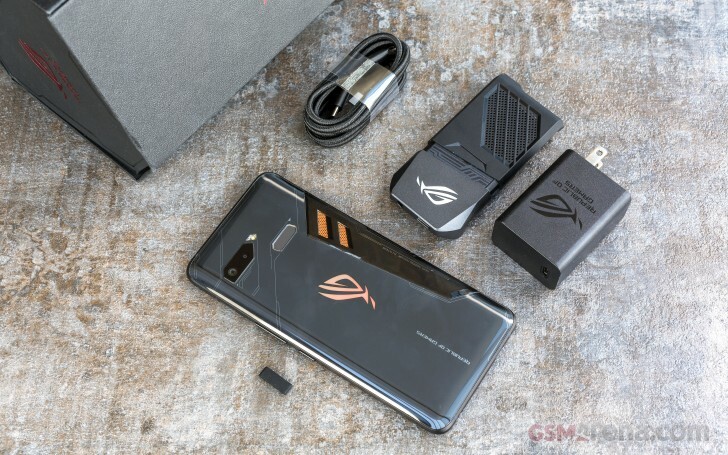 Last, but definitely not least, Asus includes its fan clip-on accessory in every ROG Phone box. We will talk more about its aesthetics later on and its practical performance benefits in the benchmark section. It is clearly a unique solution in the mobile realm and one that surprisingly does not disappoint in practical terms. 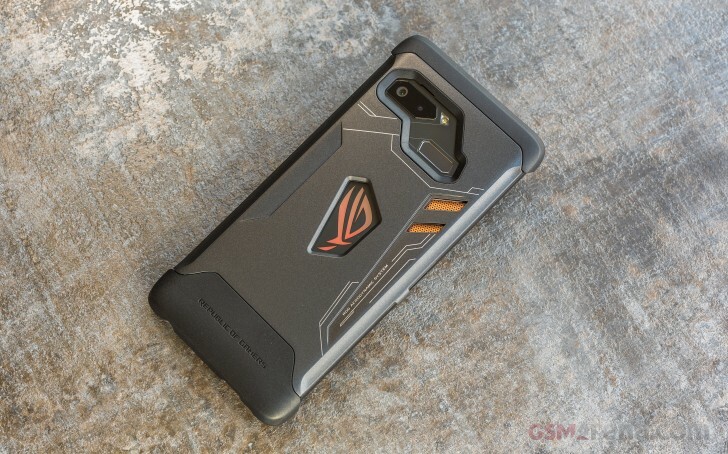 In certain markets, the retail box will also include Asus’ own unique case for the ROG Phone. It features a rather out-there three-piece design, complete with two-sided adhesive pads to hold the top and bottom segments to the phone. This is necessary since the middle bit can be popped out at any time to attach accessories to the device. It is held on by plastic clips. Definitely not the most elegant solution out there, but probably the best one can hope for given all the expandability of the ROG Phone.